It would be very difficult to find the best Mediterranean diet culinary dishes since ‘’best’’ is subjective and varies with each one’s criteria. One thing for sure is that the Mediterranean diet so rich and so diverse that can satisfy the most difficult follower. The med diet culinary dishes vary in size, taste, texture and by many other factors but one thing they have in common is the Mediterranean freshness and healthiness. We will try to cover as many tastes and origins as possible by providing a diversified list of what we and some of our followers and readers consider as very good Mediterranean dishes. Lamb shawarma: The Arabic name of this delicious food comes from the word ‘’turning’’ and it is similar to Turkish ‘’Donner Kebab’’ and the Greek ‘’Gyros’’. All of these foods come in variations of meat used, pork, beef or chicken. Meat is seasoned in various Mediterranean herbs and spices, piled up, placed on a vertical spit and grilled for hours or even a day. It is served in pitta bread with any of the following: salad, tabbouleh, tzatziki, tomato, cucumber and tahini. You can find this food in the streets of the all cities and in almost all Greek, Turkish, Arabic and Armenian restaurants. Let us not forget that meat can be eaten 2-3 times a month. Imam Bayildi: It is a vegetarian dish which originated from Turkey but it is now part of many Mediterranean diet local cuisines. It is considered to be a Turkish hot tapas or a dish in the Greek meze variety series. This Mediterranean diet dish is essentially eggplant staffed with onion, garlic and tomatoes cooked in olive oil and served hot or cold. Fried Halloumi Cheese: Halloumi is a white cheese that is made from sheep and goat milk and it is the native product of Cyprus. It is probably the only cheese that can be grilled, fried or eaten raw. It is part of the Greek, Cypriot and Turkish cuisine and its salty and smooth but yet refined taste can add value to salads or other dish combinations. It can be served with grilled and lightly marinated vegetables such as peppers and onions. It is also great as snack in pitta bread with a slice of tomato. Spanish Paella: This dish is rice dish which originated from Valencia, Spain. It comes in many variations with various and different contents that can satisfy the most demanding customer. 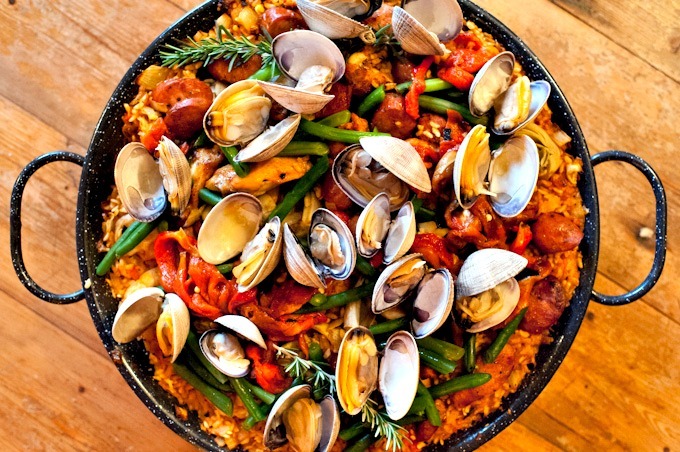 The seafood paella is the most widely spread paella type and this medley of seafood and fish is cooked in tomatoes, white wine sauce, olive oil and has many Mediterranean spices like rosemary, paprika and saffron. All these make this famous dish, a healthy and popular dish around the world. Spanish Tapas: Tapas are probably the most well-known appetisers and they have originated from Spain. You can have these appetizers in almost any café, bar or pub in Spain and any representative Spanish restaurant in the world. They can be served hot or cold and may contain fish, vegetables, cheese or meat. They may have different Mediterranean spices and may be dressed with olive oil or vinegar. Greek Salad: This is probably the first dish that comes to everybody’s mind when the Mediterranean diet is mentioned. The Greek salad has started to be a summer salad due to its contents but nowadays can be enjoyed anytime of the year and any time of the day. The Greek salad consists of tomatoes, cucumbers, green peppers, red onions, feta cheese, and olives. It is seasoned with salt and oregano and sometimes dried mint that stimulates appetite. It is dressed with olive oil and in some cases vinegar. It is a very healthy dish that can be taken as lunch or light dinner. Italian Lasagne ( lasagna): It is a classic Italian dish that has become very well known in the whole world and comes to the table in great variations and tastes. It is considered to be a pasta dish with its basic ingredients being: ground beef, ricotta, mozzarella and parmesan cheeses. It is served hot and the traditional recipes have been passed from generation to generation. Moroccan Style Lamb Brik with Couscous: One of the famous and delicious dishes of Northern Africa is the Moroccan style lamb seasoned with cumin, thus giving it the exotic and fantastic culinary flavour. The lamb is served with another Moroccan dish, couscous, completing the magic culinary combination and providing to the ordinary person an exquisite dish to remember. Maltese Fenkata ( rabbit stew): This is the traditional dish of Malta and it is probably one of the best rabbit dishes around. Rabbit meat is considered to be a delicacy and probably the healthiest meat that can be eaten by man. The stew apart from the rabbit contains onions, tomatoes, Mediterranean bay leaves, various other herbs and spices and it is seasoned with Mediterranean olive oil. As we stated in the beginning of this article it is very difficult to provide in a short list the best Mediterranean dishes but we tried to give the most representative ones and probably the most known, with the exception of the Maltese fenkata which is most probably not known to most. The Mediterranean diet is a combination of many cultures, ethnicities, each one of which has added to the added its magic culinary touch. The basics are however there in all dishes: freshness, vegetables, pasta, couscous, olive oil, herbs and spices.